The general shape of the official CYM emblem is reminiscent of an ancient shield. Shields of this type once served warriors, or druzhynnyky, as protection against enemy sabres during battle. Similarly, one’s upbringing in the CYM tradition, which is based on the high moral and ethical ideals of our nation, should serve as a defensive shield in today’s spiritual battle to fortify our national Statehood. The emblem’s background is blue. 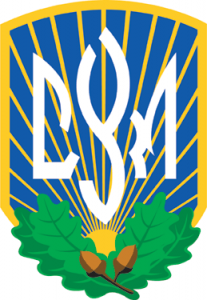 Attention is drawn to the main figures, three letters “CYM” in white, embroidered into the form of the Ukrainian Trident, or Tryzub. This alludes to one of our aims – helping the Ukrainian nation and State. The white color of the letters symbolizes the symbolic purity of the CYM ideals. Beneath the letters “CYM” appears the rising sun. Its golden rays stretch to the outer boundaries of the shield, symbolizing the spread of our ideals; they serve to support the letters “CYM”. The rising sun lights the path to achieving our goals, to attaining a life of fulfilment for our people in their own land. We yearn for the lighted path of the sun, and work to achieve new heights. Cradling the rising sun from below are four oak leaves, with a pair of ripe acorns. The green of the oak leaves symbolize youth, vigor and strength, alluding to CYM’s motto “Hartuis”, which connotes: “Inure your soul and body, so that you may have the fortitude to counter life’s trials”. The ripe fruit of the oak, its acorns, alludes to the fruit of our daily hard work. Lastly, the blue and yellow colors of the CYM emblem serve to remind one of the colors of the Ukrainian national flag.